Loop, Writing Pad, 2 Business Card Holders and a File Pocket. Note: Pen is not included with the padfolio. Deboss Plate Charge: $70.00 up to 12 square inches, $2.50 for each additional square inch. Maximum of 18 sq in. Reorder setup charge: $20.00 per color/location within 2 year of last order. 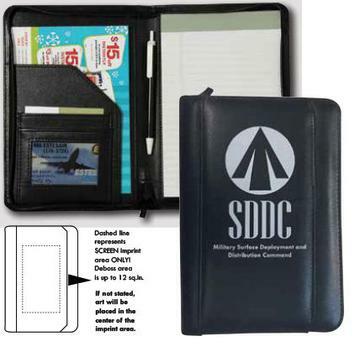 Minimum imprinted order is 20 units with a $50.00 less than minimum charge. Enter quantity needed and submit order. We will call to go over printing specifications, shipping cost and payment terms. No order is printed until all artwork is approved.